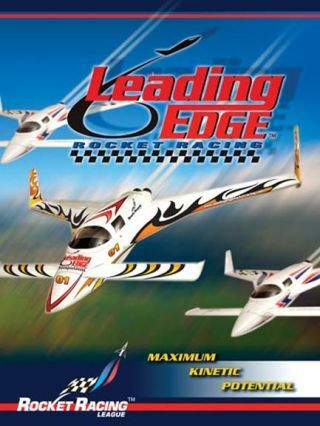 A poster for Leading Edge, the first team to join the Rocket Racing League. F-16 pilots Robert 'Bobaloo' Rickham and Don 'Dagger' Grantham, Jr. founded the Leading Edge Rocket Racing team in early 2006. This story was updated at 5:03 p.m. EDT. The firstteam to join the growing Rocket Racing League (RRL) has pulled out of thehigh-flying venture, citing fundamental differences. The Leading EdgeRocket Racing team announced its intent to withdraw from the nascent leaguelate Friday and was due to formally notify its board of directors earlier today. "Afterworking with [the] Rocket Racing League for the past 17 months, we haveconcluded that our vision, business practices, and communications standards areincompatible with those of the league," Robert Rickard, Leading Edge presidentand CEO, said in a statement. "We had very high hopes for this enterprise andtried very hard to find a common way forward." Formedin 2005 by Ansari X Prize founder Peter Diamandis and auto racing teamveteran Granger Whitelaw, the Rocket Racing League is intended to provideNASCAR-like races in the skies above Las Cruces, New Mexico using piloted Mark1 X-Racer rockets. The rocket racers are based on the EZ-Rocket designdeveloped by the firm XCOR Aerospace in Mojave, California and are slated tomake their competitive debut later this year. Rickard andDon "Dagger" Grantham, both of Phoenix, Arizona, announced their Leading Edgeteam in January 2006. Both men are experienced pilots and fly F-16 jets for theU.S. Air Force reserves. "There hasn'tbeen a working relationship between our company and the RRL for some time now,"Grantham said in the statement. "This announcement makes it official so we canmove on." Whitelaw, whoserves as president of the Rocket Racing League, told SPACE.com Monday that teams will expectedly come and go as the league develops, though all must meet baseline requirements. "They arewelcome to race in the league when they are properly structured,funded and in accordance with our rules and regulations," Whitelaw said of the Leading Edge team. The RRL hastwo other teams that include the Bridestine Rocket Racing Team led by formerU.S. Navy pilot Jim Bridestine, as well as the New Mexico-based Santa Fe Racingteam founded by Albuquerque land developer Marc Cumbow and his father Edward, aretired U.S. Air Force pilot. The leaguealso has its own house rocket, the Thunderhawk X-Racer.